The morning of Wednesday, 25-Apr broke with a mostly clear sky, a mild breeze and a mostly dry forecast for the day. At last! 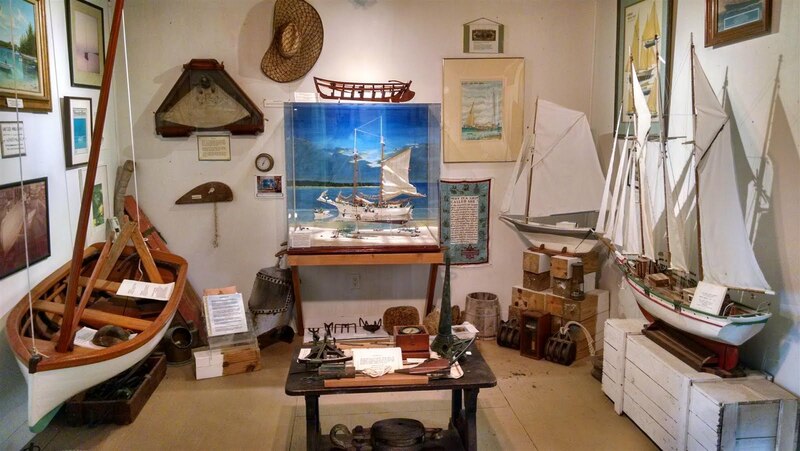 We rode the dinghy into town to tour the Wyannie Malone Historical Museum, whose namesake is credited with founding the Hopetown settlement back in the 1780’s. 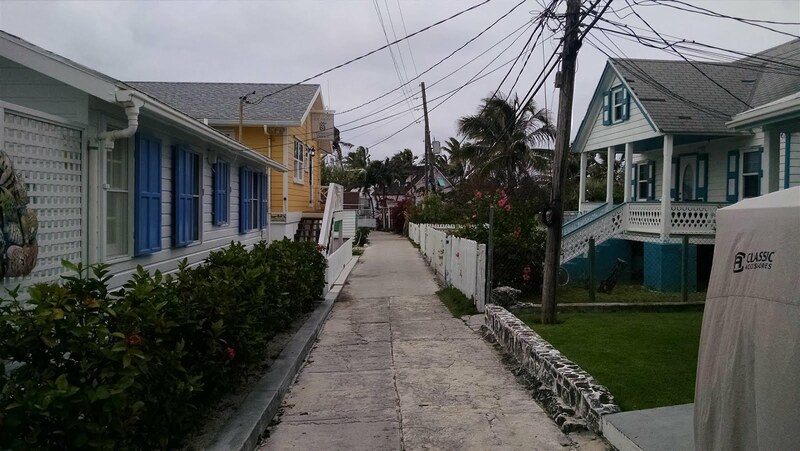 It is a quaint two story, renovated house packed with artifacts and memorabilia whose stories walk you through the Hope Town settlement’s history. It exists primarily because people like Wyannie couldn’t tolerate – and wanted to escape from – the post Civil War conditions in the Carolinas. We learned that one of the main means of support for these islanders was salvage work – retrieving all sorts of goods from ships that frequently ran aground on the numerous nearby reefs and shoals. We also learned that they were not too thrilled with the erection of that light house, as it led to a significant shrinkage of the salvors’ line of business. Their response was to sabotage the light and build bonfires on some of the reefs to attract ships into the shoals. Fortunately the place was eventually recognized as a great vacation destination and provided them an alternative via a thriving tourism economy. After that we took a long walk to the south end of the island to have lunch at On Da Beach. 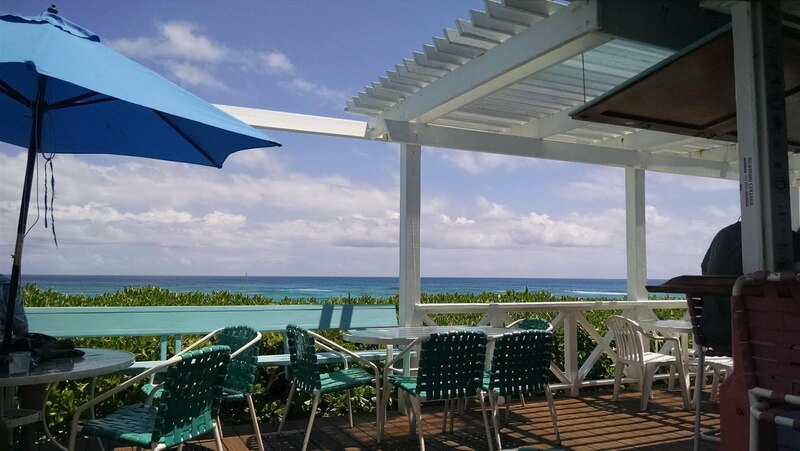 It’s yet another Bahamian eatery that boasts stunning views of the Atlantic Ocean and a long sandy beach. Their Mahi sandwich is quite good. By then it was time to get back to Ghost Rider so we could depart on the next high tide. 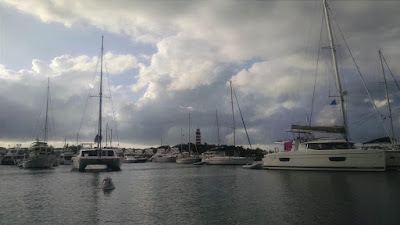 At 1630 We retrieved the dinghy back to the boat deck, released our mooring tethers, and carefully snaked our way out of the harbor channel back into the Sea of Abaco….with just enough water under the keel to keep the boat from bumping bottom. 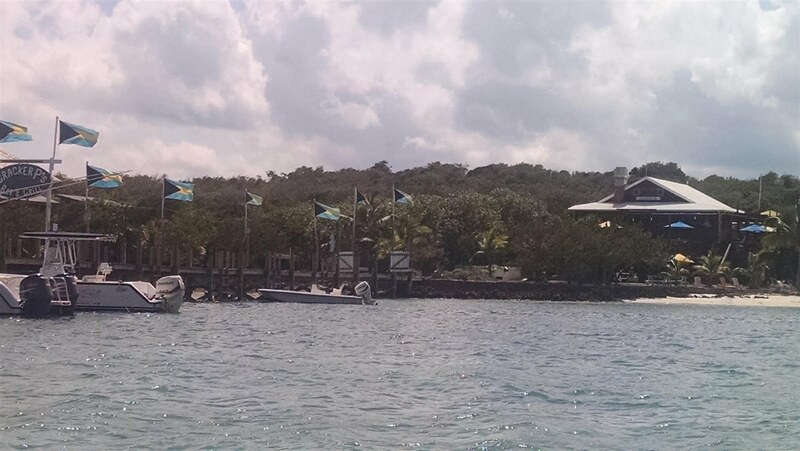 Despite the circuitous route we had to take to avoid the shallows, it took us less than two hours to reach the Tavern Cay / Tiloo Cay anchorage. 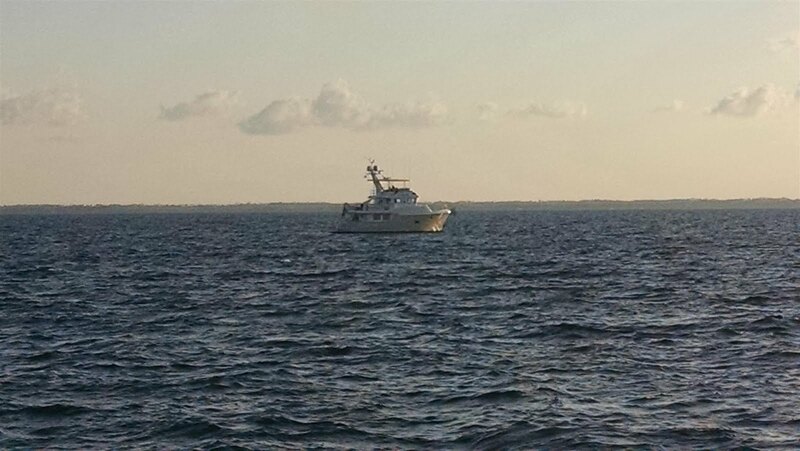 Waiting for us there were Brad and Lorraine Carlton aboard their Nordhavn 55, Adventure. We dropped the hook nearby in 10 feet of water, got a good set, and settled in for the evening viewing a gorgeous sunset. 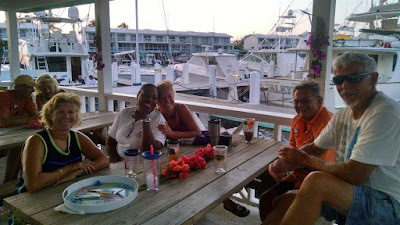 Brad and Lorraine joined us aboard Ghost Rider after dinner for some libations and boat / travel talk, and we had a very enjoyable social evening together. The next day, Thursday, 26-Apr brought more pleasant weather. But Chelle had a restless night and wasn’t feeling well, so we just chilled out and relaxed on board all morning. Rick got a few more chores done, checked weather, and started looking at destination options for the next few days. By mid-afternoon Chelle’s morning naps had a restorative effect so we took the dinghy out for a tour of the waters around Tiloo and Tavern Cays. 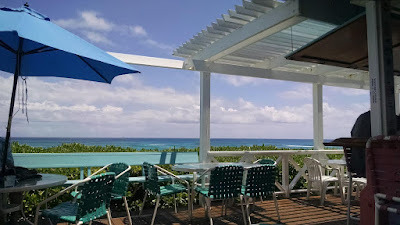 There are some nice properties and upscale homes dotting the shorelines, along with Cracker P’s Bar and Grill further north near Tiloo Cut (which provides a narrow, twisting channel into the open Atlantic.) The waters were still gin clear providing great visibility of the grassy and sand bottom in depths that varied from a couple of feet up to eight feet, with the typically stunning shades of blue, green and turquoise. We enjoyed another peaceful evening and night at anchor, and while Rick got a good night’s sleep, Chelle did not. By Friday morning, 27-Apr, it was obvious that Chelle still had some kind of stomach bug, likely food-related based on the symptoms. There were a couple things she had consumed on our last day in Hope Town that Rick had not, so that was our best guess, as he felt fine. We could not find an oral thermometer in any of the medical kits, so improvised with a digital meat thermometer....she was running a low grade fever, which we treated with Tylenol. Still, by late morning she was able to soldier on, so we picked up the anchor and headed further south. Based on predicted winds we wanted to check out the bay adjacent to the northwest edge of Little Harbour that promised protection from SSW winds. But when we arrived there a couple hours later it was pretty obvious the swell from the cut into the Atlantic Ocean just to the east would make that locale most uncomfortable – and there was no way we were going to attempt the very shallow channel into Little Harbor’s basin. So we back-tracked a mile across to the other (east) side of the channel to Lynyard Cay, and we found the protection from the swell to be excellent. 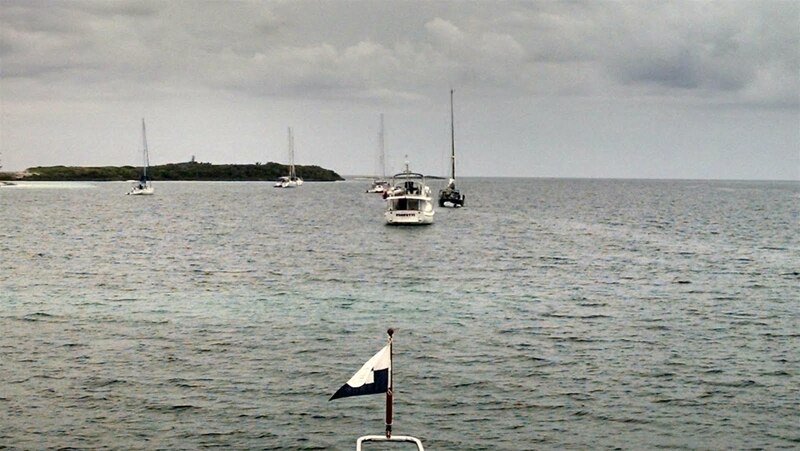 Although exposed a bit to the SW winds, it wasn’t enough to bother a heavy boat like Ghost Rider. The depths there held steady very near the shore, so we tucked in pretty close to the shoreline, and found a sandy patch of bottom where we dropped the big Manson Supreme anchor. It set on the first try, and given the predicted overnight storms we let out some extra rode for good measure. 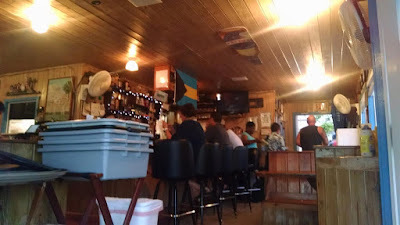 One of our goals on this leg was to visit Pete’s Pub in Little Harbour, but the wind and swell between here and there made that an unattractive jaunt in the dinghy; besides, Chelle needed to rest, so we spent a quiet evening on the boat, and put Pete’s on our list to try the next time around. The predicted front and associated line of TRWs arrived in the wee hours, but nothing approached the severe level. By the time we awoke the morning of Saturday, 28-Apr, only light showers remained in the area….and Chelle was feeling better. The forecast for the next few days was actually – finally – looking pretty good. 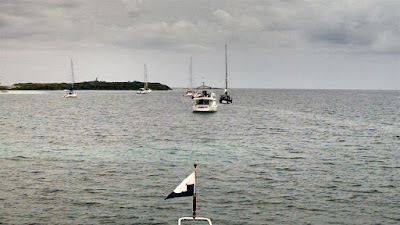 Just before 1100 we retrieved the anchor and got underway, pointing Ghost Rider in a southerly direction. 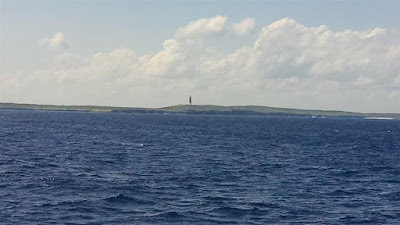 Three miles later we traversed the cut just north and east of Little Harbour and entered the open waters of the Atlantic Ocean. Sea conditions were as expected, just a tad bouncy with three foot swells out of the east and a two-to-three foot healthy wind chop on top given the 15 knot southwesterly breeze. 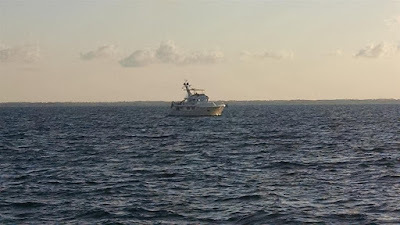 The stabilizers did their job in the confused short-interval seas and Ghost Rider happily punched through, with only an occasional “bulbous bow bounce”, averaging 7 knots at a loping 1400 RPM on the big Lugger diesel. 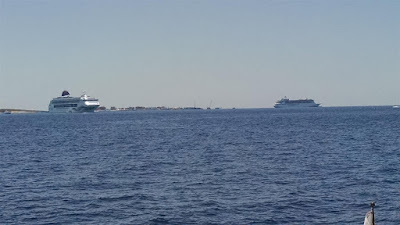 It was actually a nice change of pace to be in open seas and deep water – hardly any traffic with depths measured in the thousands of feet as both sounders lost sea floor contact. At high noon we had mostly clear skies overhead with small puffy cumulous clouds dissipating in the west, and the remnants of the storm clouds still towering but far to the east. Outside air temperature hovered in the upper 70’s with the typically high humidity seen in the open ocean after a frontal passage. By mid-afternoon the winds had tapered off a bit, white caps diminished and the ride smoothed a bit. 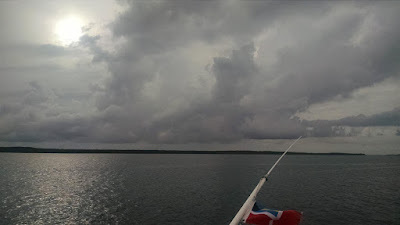 Then, as we rounded the southern tip of Great Abaco, the winds and seas picked up again. It was a see-saw day. The morning of Sunday, 29-Apr was a whole lot calmer than the previous evening with only a fairly gentle roll coming at Ghost Rider from the south. 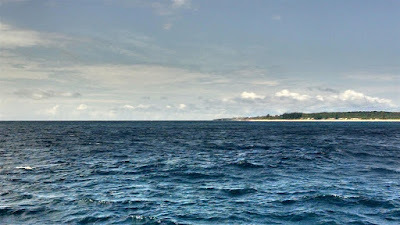 Weather looked ideal, with clear skies, mild temps and almost flat seas. 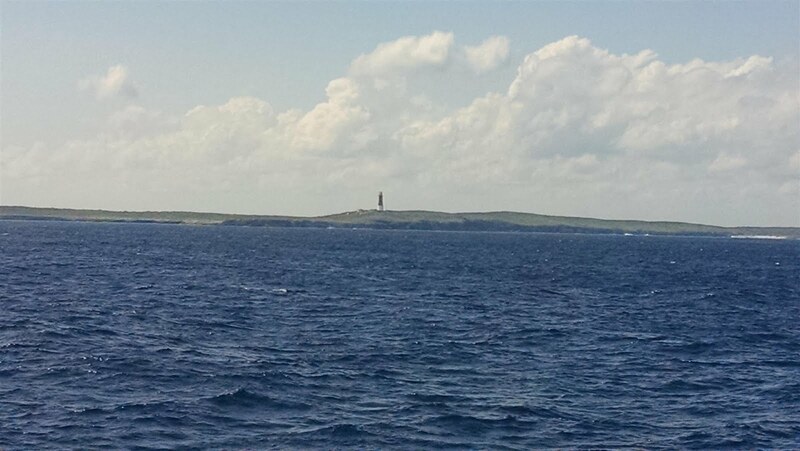 We retrieved the anchor and were underway by 0945 and steaming southwest towards Great Harbour in the Berry Islands. 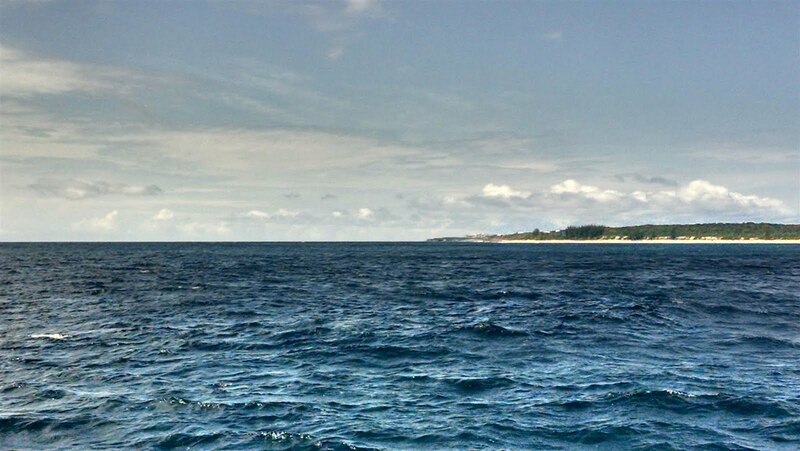 It was a completely uneventful, peaceful and smooth sortie all the way across the channel; it would be wonderful to be able to bottle and save this kind of cruising weather. Chelle did most of the driving from the fly bridge (without stabilizers), while Rick handled the first engine room check in between naps; that’s a good definition for a smooth cruising leg. 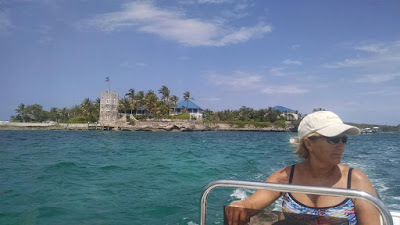 This one was less than 50 nautical miles and by 1400 we were rounding the northwestern point of Little Stirrup Cay and steering Ghost Rider down the western shoreline of the Berry Islands, avoiding a couple of large cruise ships and several parasail boats along the way. 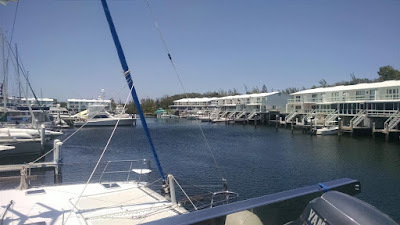 Just before 1500 we entered the (very) shallow bay that lays just west of the Great Harbor Cay Marina…at low tide. While the tides only vary by a few feet in this area, we decided then and there that we’d try to depart this place on a high tide when that day came. We saw as little as a half foot underneath the keel before we turned the corner into the (very) narrow entrance into the marina’s basin. If they were trying to hide or disguise the entry channel to the marina, we have to compliment them on a job well done; you have to idle right up to the rocks before you see where to turn hard to port into what looks like a rock-lined alley. Rick got to work on the wash down while Chelle handled marina check-in. And shortly thereafter we were greeted by good friends Jerry and Christine Chafton (and their too cute pup, Annie.) They’ve been our “neighbors” at the Legacy Harbour docks in Fort Myers for some years now aboard their 53 Navigator, Mystic Lady, and have also been cruising the Bahamas this spring – and we had finally caught up with them. We’d both had the same idea….with high winds and nasty seas forecast to move in over the next week, this was a good place to hang out for a while. We got the boat and ourselves cleaned up, had a quiet dinner on board, dipped into a few Goombay Ghosts, and called it a day. The weather conditions we awoke to on the morning of Monday, 30-Apr, were excellent, with fair skies, mild temps and a freshening breeze. Since we would have a whole week here we decided to make this day one for chores. Chelle wanted to clean the interior of the salty film that inevitably results from ocean crossings with an open boat, as well as scrub down the dinghy, as it was pretty grimy from weeks of usage. 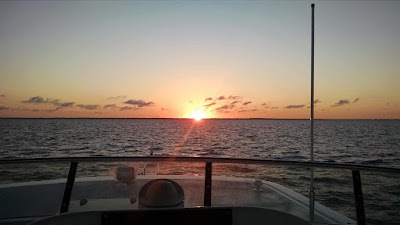 And Rick wanted to knock out several days’ worth of current and forthcoming Wheelhouse maintenance items to allow for off-the-boat exploring the remainder of the week. When all that was completed we enjoyed one of the marina’s weekly evening rituals, the Pot Luck Dinner at their nearby picnic shelter. 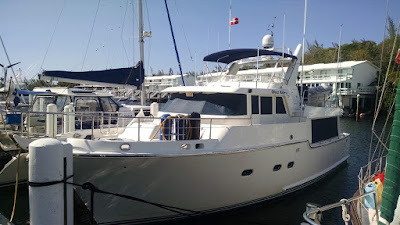 There was plenty of food and drink, and we got to meet many of the other crews, including Betsy and Hank Knoblock who had their Nordhavn 60, My Harley, here. 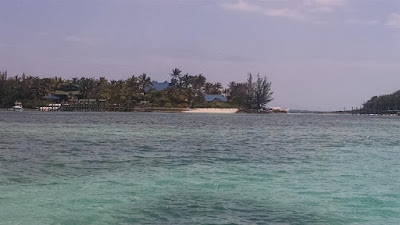 And we planned some touring activities with Jerry and Christine as they knew this island very well from previous visits. We’ll post another update after we’ve accumulated some touring time on this charming island. ** What’s a “flopper-stopper”? Essentially it is a large folding aluminum plate that is deployed from a boom and secured with several guy wires; the plate is positioned several feet beneath the water’s surface, and the plate’s large surface area provides rolling resistance in surge or wake conditions. It’s a pain to deploy and retrieve, but it can be quite effective in stabilizing the boat while at anchor in rolly conditions. You can find more info and pictures HERE. As always enjoyed your reports, sounds like alot of fun. I do miss the smell of the salty air. The weather here has finally hit in the 70s so all is good. We have about 500 projects lined up. We have a pond behind our place with a pair of canadian geese who just had 6 young ones. 500 projects….sounds just like owning a boat.